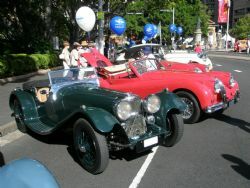 Classic cars were in abundance at the annual NRMA Motorfest 2008 held on Australia Day in and around Hyde Park in Sydney. 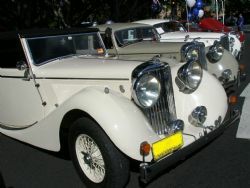 Previous years have seen over one thousand classic cars being driven to town and then proudly displayed up Macquarie and College streets, and this year was no exception. Just about every marque was represented by their respective car clubs stretching from a few very early 1900-1910 cars through the veteran, vintage and classic era’s. Admirers, enthusiasts, club members and even some late night revelers sleeping off the night before in Hyde Park were greeted with a classic summer day with just enough breeze to knock the humidity down to an acceptable level. Street vendors were all smiles, the NRMA were well represented at a variety of locations and at the top of Martin Place the Veteran, Vintage and Classic Vehicle Insurance team had a tent set up providing insurance advice and expertise. I arrived early and was able to sit in the shade and watch the gorgeous cars being driven past to their parking place for the day. By 9.00am you could still easily get a coffee, check out the action and watch the procession go by. I couldn’t say the same thing by 11.00am as the crowd was thick and enjoying the carnival atmosphere that Australia Day provides. There was plenty of entertainment for the whole family with kids stages set up in Hyde Park. The ABC had a big presence and there were numerous stages catering for all manner of entertainment for the youngies and older kids alike. This gave me the perfect opportunity to drop the misses and daughter off in a nice shady spot to watch Captain Feathersword perform and allowed me to get out amongst all the classic cars on show. 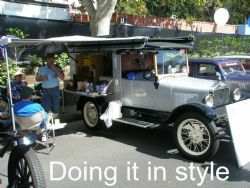 There was a big turnout of Model A Fords, MG’s, Jaguar and old Holden’s. A lot of the clubs had banded together so the vehicles and members were all parked in close proximity to one another yet there was always some surprise lurking just down the road. The classic 50’s caravan was there to be seen hanging off the back of some equally classic 50 and 60 icons. The owners had gone to great lengths to represent them in period furnishings and fittings and they proved popular with everyone that stuck their head in for a sticky beak. Simca, Huppmobile, Bentley, Ford, Morgan, Morris, Studebaker, Volkswagen, Dodge .......the list went on. There were classic old trucks, mini race cars and a big contingent of Land Rovers on the corner of Philip Street. This bought a smile to my face as I used to have a two door 1978 Range Rover and one in similar colours was up on the pavement. In fact most of them were up on the pavement and to save the pedestrians any future grief under just about every one of the landies was a silver barbecue tray to recycle the oil. Ah, the memories. One disappointment with Motorfest was very few owners were around to have a chat with in the morning. I can understand it would be a very long day for all and it lacked that intimacy you often get at a local car show. Still, it is always worthwhile to get into town, check out Motorfest and then kick onto some of the other great events that feature in the Sydney Festival and Australia Day calendar. 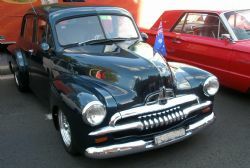 With it's proud history, I look forward to Motorfest 2009 next Australia Day.